In Italy, every region, province or town, has its special Christmas Eve’s supper culinary tradition, with at least one specific recipe or ingredient that should never miss. Eating Capitone on Christmas eve (eels) is a tradition common to various regions, Friuli, Veneto, Comacchio in Emilia Romagna, Naples and Apulia. Regourously fried in Naples, grilled, baked or stewed in other places. 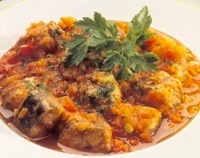 Below you find a recipe for Capitone in Umido typical from Apulia. Chop the onion and garlic and place in a saucepan with olive oil over a moderate heat. Fry gently for a few minutes, then add the vinegar. Stir in the tomato sauce and add a glass of water, salt and pepper to taste and let it simmer over a gentle heat for 15 minutes. Then add the eel, previously cleaned and cut into 2-3 cm pieces and simmer for 30-45 minutes without stirring. Sprinkle with parsley and serve hot.